Eleven years after Frank Sinatra appeared in Suddenly, he starred in yet another railroad movie. 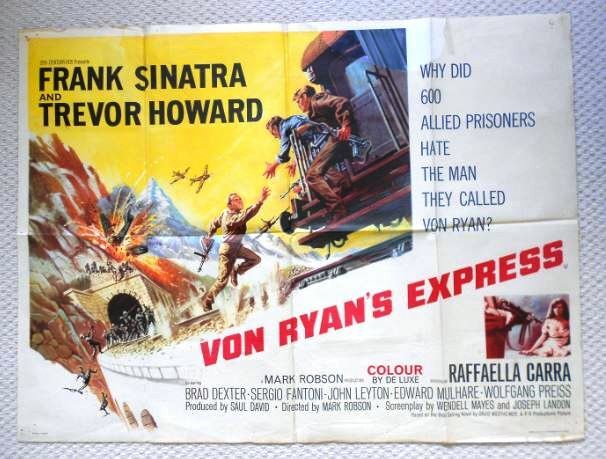 Filmed in Italy, Spain and the studio back in Hollywood, Von Ryan’s Express is the tale of WW2 Allied prisoners commandeering a train and making a run for neutral Switzerland. Frank plays the anti-hero, USAAF Colonel Joseph L. Ryan who leads the onboard train revolt in this action-packed war picture. Lots of scenic train vistas, fiery explosions, and even a little cheesecake in the form of Italian actress, Raffaella Carra. I say we take a train ride with Frankie and escape from those pesky Krauts! Engine 51 sweeps over a magnificent arched viaduct as it heads north to Germany with its trainload of Allied prisoners. Our first train scene occurs 42 minutes into the picture. Here we see Frank, Trevor Howard (as the perpetually-disgruntled Major Eric Fincham) and others loading into wooden FS rolling stock. Before you know it, the train is sweeping into Rome where it comes to a halt for the first meal stop. The train driver (played by Vito Scotti) looks back as the Germans roll out their soup kitchen…at gunpoint. Frank and Trevor talk it over with the officer in charge. That gent with the rakish eye patch is Italian actor Sergio Fantoni who plays Captain Oriani. Lots more FS freight cars in shot as the POWs head for the chow line. Whilst the prisoners partake, a private car is switched onto the rear of the train for the convenience of the German officers. As the train pulls out of Rome, we get a nice close up view of the steam locomotive and sleeper-lounge-observation. Frankie gets a piece of scrap metal and pries the wooden floorboards up. Next thing you know, he’s on top of the car, rope in hand, to bushwhack the expendable guard. At the next water stop, they take over the private car too. Hey, the kommandant has a map of the route! How convenient! Soon enough, the Allies discover the kommandant’s mistress Gabriella (hubba-hubba) in one of the rooms and hustle her up to the lounge area. Seig Heil! One of the Allies (Costanzo as played by Edward Mulhare) speaks fluent German and is immediately recruited to pass for the kommandant — and head up to the tower at Florence and reroute them towards Switzerland. Frank poses as his machine gun-toting aide. The ruse works and soon they are on their merry way towards Milan. Gabriella sashays by with a couple cereal bowls as the boys plot their next move. The train stops to take on water and we get a decent view of the rather ornate waterspout. The treacherous Gabriella makes her escape to betray the Allies. Ow! Ow! Ow! She still looks faaaaabulous as she is offed, just steps from the local police station. So. It’s going to be a total weinerfest the rest of the trip. Dang! On the outskirts of Milan, Von Ryan’s Express trundles through during an air raid with fireworks aplenty. The train is on fire! The next morning the barely-singed train is passing through Passo Malajo, just 130 kilometers (80 miles) from Switzerland. From this point on, the filming location switches from Italy to Spain (in El Chorro, a region of Málaga). The prisoner’s train soars across another magnificent arched bridge (love those “portholes”!). Bad news. The Krauts are onto them and racing along with a trainload of soldiers in pursuit. As if that weren’t bad enough, the Germans have also sent in the Luftwaffe to strafe and shoot missiles at our intrepid escapees. Frank and the boys shoot back from the locomotive. One more tunnel to freedom in Switzerland and then….rocks on the tracks! Slide the drivers on the little 2-8-0. The train comes to a halt just short of the blockage. Great. Now what do we do? Pull up a rail behind us and bring it forward! (with trackwork tools conveniently located in nearby bins). The Germans are stopped, but not for long. Unload those men! Schnell! Schnell! The Krauts move cautiously forward. Yaahhhh! Get ’em, Frankie! Aaaaand, the credits roll. Well, not just yet. I’ll let you guys watch the movie and find out the ending for yourselves. It’s pretty good. While not exactly obscure (anything with fellow Jack Daniels-lover Frank Sinatra CAN’T be obscure), Von Ryan’s Express is a great picture for an evening’s entertainment and since it’s loaded with train scenes and action, you can’t miss. The best is yet to come. This entry was posted in Uncategorized and tagged 20th Century Fox, Bologna, Edward Mulhare, Florence, Frank Sinatra, Italian State Railways, Italy, Jack Daniels, Luftwaffe, Milan, Nazi Germany, Raffaella Cara, Rome, Sergio Fantoni, soup kitchen, Spain, Suddenly 1954, Switzerland, Trevor Howard, Vito Scotti, Von Ryan's Express 1965, World War 2. Bookmark the permalink. The actress who played Gabriella, Raffaela Carra, later had a massive hit single in Europe in 1977 with a song caled Do It Again. Not many people realised that she had her first big break playing the murderous Gabtiella in Von Ryan’s Express.